We had an early breakfast and went to Sagrada Familia in the morning. Despite being incomplete - actually, because of it - this was one of the most interesting Cathedrals we have visited. The lines were not terrible, however, since the cathedral is still under construction, the visitors’ path was confusing. The path often doubled back on itself, which was bad news for tourist groups since they created traffic jams every time they had to turn around. First, we went to the nativity lift. The line said 30 minutes but it only took about 15 minutes to get in. The elevator took us part way up, and then we had to climb tightly spiraled staircases until we emerged on the bridge spanning the towers. The city spread out below us and we could see a close-up view of the construction over the roof. Seeing this work in progress made me appreciate how long it must have taken to build some of the European churches we’ve already visited like Notre Dame and St. Peter’s Basilica. In addition to the painstaking care that has to go into each detail, a constant need to raise money adds possible delays to the construction. Sagrada Familia is inspiring because it is a privately-funded church. It was nice to know where our entrance fee was going. We descended a narrow set of stairs, until we reached the ground floor again. A giant tour group was blocking the way into the Cathedral, so we toured Gaudi’s school first, and returned when everyone had left (timing is everything). The museum showed how Gaudi used an intricate system of string, weights and gravity to design the supporting structure. In the workshop, a sculptor worked on plaster models for the Passion Facade. Finally, we stepped inside the Cathedral itself. Someday this will be an expansive, airy space. For now, a forklift moved heavy material around, scaffolding reached to the ceiling and blue sparks flew from welders several stories above us. While the exterior of the Cathedral is busy and sometimes cluttered, the interior is simple and pure white. A few stain glass windows had been installed, and light filtered brilliantly into the space below. The columns supporting the nave were modeled like giant, twisting ivory tree trunks, with side branches sprouting about half-way up. The complex, organic designs added much more than just round columns. It was hard to believe that Gaudi had envisioned this design almost 100 years ago. It made us wonder, was this design even possible back then? Or did he just have faith that the technology to realize his ideas would eventually develop? When we arrived in Santiago de Compostela the air was damp and the streets were wet with rain, but it was not raining. We made our way up the hill, past some surprisingly modern buildings and art installations, to the old part of town. The narrow twisting alleyways were lined with covered shopping arcades supported by huge granite columns. The sun was beginning to rise, but the clouds were so thick that at this hour, all it could do was illuminate the sky a deep blue. A group of horses and riders materialized out of the dark and rode through the empty streets ahead of us. Santiago is in Galicia, a very wet part of the country, vibrantly green and covered in moss. Everything here appears to be made of stone - the buildings are granite, the roofs slate, and the streets cobbled. It seems more like Ireland in a way. In fact, the Galician culture has Celtic influences in its past (the people here are very fair-skinned and we saw many redheads). We made our way to the cathedral, a dark granite, moss and lichen covered church whose tall central tower projected a bright yellow light into the dark dawning sky. As we crossed the plaza, the bell began to ring...ding...dong....in long deep tones. We admired the towering building before making our way to Hostal Girasol. The modern white cafe attached to the hotel provided bright contrast to the weather and buildings outside. Although our room was still occupied, we were able to freshen up and eat breakfast (eggs & thick bacon) before leaving our bags behind the counter. We thought about going into the church, however the line was already very long. The plaza was filled with colorful umbrellas that didn’t seem to be moving. Like Seattle, there were many sun breaks throughout the day. Each time the rain stopped, pilgrims and tourists crowded into Praza Obradoiro, exhausted and happy. Some of them had the telltale pilgrim limp, many carried walking sticks and others leaned on their bikes. All of them looked tired. People passed cameras back and forth snapping pictures in front of the cathedral and by the shell marking the end of the journey. As soon as the rain started back up the hordes of people would run to the closest cover - the arcades, shops and the two feet of dry space next to the church walls and wait for the next break. These waves of bodies continued, like a tide, until the sun went down. We ate lunch in the restaurant across from our hotel. Spaghetti for Ryan and gerol soup for me. The soup is a local specialty made with gerol, a turnip-like vegetable grown only in Galicia. After lunch, we went to the bus station to get our tickets to San Sebastian and got lost on our way back. We had wandered off the map so I had to practice my Spanish, asking directions often. This was made harder by the fact that quite a few Galicians don’t speak Spanish at all and it is not the preferred language for many others. When we finally found the church two lines had formed, so we got into the shorter one which was moving quickly. Inside, the church felt like a pilgrimage church - not cluttered or overly flamboyant. Symbols were carved into the columns and a large eye peered down from the ceiling. It would be the perfect setting for a Dan Brown novel. We passed under the Portico of Glory, which was under restoration and covered in scaffolding. A white marble column near the Portico was intricately carved. Deep indentations showed where the hands of millions of pilgrims have touched the column. We explored a few side chapels before gazing at the altar, which is a giant golden canopy. The immense, incense-burning botafumeiro (supposedly used to suppress the smell of all the pilgrims) is suspended from the arches of the dome, with a pulley system to swing it. The back half of the church, with the tomb of St. James was roped off, explaining the second long line. we would have to tackle the other longer line to see the tomb of St. James (Santiago). The stones and air were cold and damp, so we warmed up at Cafe de las Crechas with Cola Cao (our favorite drink of the trip) and cafe con leche. After a nap in our slightly damp room, we found Casa Manolo, a place that Rick Steves’ had recommended for dinner. The fixed 8.50 euro menu made choosing easy. We ordered grilled hake and squid as our main courses. The food was good and it was the first time we had felt full the entire trip. We purposely scheduled our trip to coincide with the Semana Santa (Holy Week). Because we traveled throughout that week, we were able to see a variety of celebrations. Each place has its own traditions and each day represents something specific. This post will cover all of the processions we witnessed, although the spirit of the week pervades everything. Specialty foods are displayed in all the markets. Families enjoy time together in the park. Trains are full as people return home. 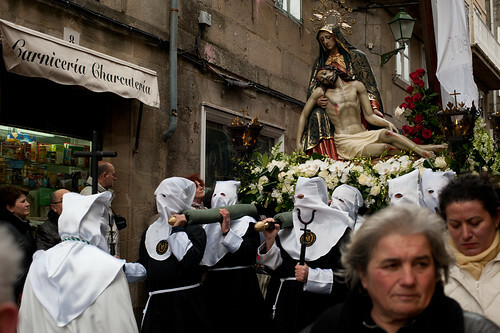 Many Americans react negatively to images of the nazarenos, or penitents, who walk in the processions. So I want to take a moment to explain what you are seeing. The hooded robes they wear come from mideval times when people wanted to demonstrate their penance to God without reavealing their identity. The colors and symbols vary for each group based on the religious brotherhood and church that the members belong to. Some nazarenos walk barefoot, often for miles. Others wear chains or carry heavy crosses. Some women will wear mantillas, which is a raised veil, that have been worn by Catholic women for centuries. These days, it is generally reserved for special ceremonies. On our way to Segovia I noticed that the snow line was not much higher than the city. And, after the sun went down we ventured into the cold air only because we could hear snatches of drumming and horns from our hotel window. The music grew louder and the procession came right up to our hotel. It was a small procession, for a small town. A single drummer seemed to be in charge of the music - his sticks white while all others were black. He would lead with a fancy drum roll and the others would follow. Drumsbeats and wailing horns echoed off the stone walls, sounding mournful in the night. 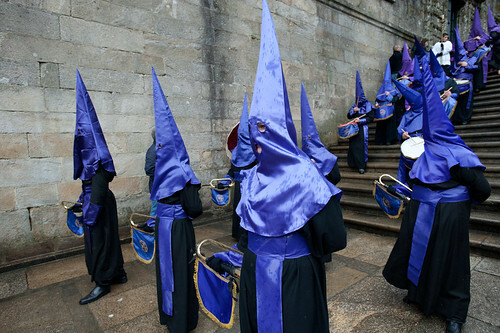 The marchers wore purple hoods over white robes and carried a small float of Jesus Christ nailed to the cross. Behind the float, four more people carried crosses of their own, barefoot despite the cold. A small, hooded nazareno held the hand of a parent as he solemnly navigated the dark. The townspeople, hoodless and bundled in warm clothing escorted the crucifix to the church. Ryan followed them in, where they took off their hoods and cheered. He was surprised at this sudden unveiling as they changed from an identity-less group back into the individual men and women of a community. Our room at Pension Arcos opened up to a small patio with a view over the Plaza. At around 10pm, we could hear the now familiar sounds of a procession starting up. Looking out, we saw the floats leaving from Iglesia San Carmen just half a block from our hotel. A small crowd was forming along the route and we joined them, finding places about two rows back. Children were pushed to the front as the crowd grew. Everyone kept an eye on them but no one seemed worried. The procession moved very slowly and stopped frequently so it took a long time for them to reach us. By then, the street was filled from storefront to storefront. Once again, a band led, this time dressed in uniforms. Hooded marchers followed carrying candles, most of which were unlit due to the wind. At the entrance to Puerta del Sol the procession stopped. People adjusted their hoods and shifted from leg to leg on the hard stone. Eventually one person tapped a staff against the ground and the procession began to move again. The float came into view, lit with candles and burning incense which filled the night air with smoke, light, and smells. It was ornate and each time it moved the lanterns and decorations shook violently. The bearers put it down directly in front of us after some more staff tapping. A woman in a gray parka jumped out from the crowd and burst into a soulful, melancholy song. Her voice was hauting as it carried above the hushed crowd and I could pick out words like Jesús and compasión. When the woman finished the crowd applauded. And then applauded again as the float bearers lifted the float with a whomp and more shaking of the intricate filigree. The float moved on across the now packed plaza. Behind it nazarenos walked between the marchers adjusting hoods, tapping out the movement and attempting to light candles. They handed out lollipops to all the kids that had been pushed forward. Extracting ourselves from the crowd turned out to be the hard part as we fought our way upstream toward the hotel with many repetitions of perdón. At about 2 am, we awoke to the sounds snares and trumpets - less melancholy and more triumphant - as the procession returned to the church on our square. There were about six Easter processions scheduled for the day, starting at 11am, and ending at 11pm. (We found horarios for each city on the internet. Like this one.) As we were heading back to the Cathedral, we ran into the 11am procession. A small band led and was followed by the main procession of nazarenos, this time in green. Again, four men followed carrying crosses and wearing chains on their ankles. 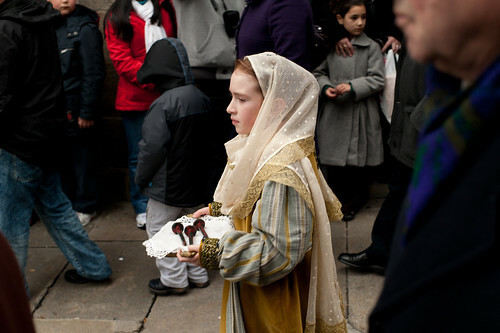 After the crosses passed, children dressed in period clothing carried religious objects like nails and a crown of thorns. Some women dressed in black, wearing mantillas followed them. Behind them were the rest of the church members carrying umbrellas as they made their way toward the cathedral. Later that day, we tracked down the sound of trumpets to Praza Cervantes. The brethren in this procession wore green or white hoods. The band, crosses and children were followed by a pieta float. The city is small and the processions move slowly, so we followed it around the block, and watched it a second time. After dinner, we heardthe 11pm procession starting, so we tracked it down to a street corner to watch. The procession wassimilar to the other ones we had seen; however this time they carried lanterns. And for this final procession they had two floats, the first a pieta float and the second brightly lit and featuring the Virgin Mary. We arrived in San Sebastian at around 6:30 am on Easter day. Since we had spent the night traveling we walked around the deserted city looking for breakfast. The street was filled with paper and bottles. The rain hadn't managed to wash away the pungent smell of beer. A well-dressed young man staggered towards us. He asked me for a light in slurred Spanish and then wandered off when I didn't have one. Other party-goers supported each other as they swayed down the streets. Street sweepers were out in force, and it was like a game of pac-man as they tried to avoid those still up after what must have been a huge party, and we tried to avoid the street sweepers. We started the day in TriBeCa on Canal Street. The tourist groups had arrived and it was impossible to get around them. This touristy part of Canal Street is overcrowded with immigrants selling cheap wares. Just like the cliche, a man with a long trench coat offered me some Rolex watches. We turned up Broadway and headed toward SoHo. Most of the trendy little boutique shops had been pushed out by chain stores. One expensive shop called Allsaints (which has now made it to Seattle), had row upon rows of black antique Singer sewing machines. Other bits of antique or (psuedo-antique?) machinery was used for shelving and display. Instead of store catalogs, they had iPads sprinkled throughout the store. Ryan bought a raccoon hat at Urban Outfitters to keep his head warm, and we visited a cool store called SuperDry, which I guess is a UK brand that features fake Japanese typography (however at $42 a t-shirt, it was a little out of my price range. This year, we found the same shirts in Turkey for about $12). The cast-iron architecture in Soho is beautiful, however nothing was more striking than the Little Singer Building. It had frilly Parisian-inspired cast-iron balconies with red accents. We stepped out of the cold into Dean and Deluca to get some warm drinks before continuing on through NoHo to Greenwich Village. Because I love When Harry Met Sally, we had to go to Washington Square Park with its imposing white marble arch that is featured in the movie. Inside the arch was a yet-to-be-decorated Christmas tree. The fountain was dry so some street performers were turning it into a makeshift amphitheater by hauling a piano. A concerned artist making designs with colored sand watched nervously from across the other side of the fountain. We peeked at the bookstore from When Harry Met Sally, and headed toward the East Village. Back on Broadway stepped into the WIRED magazine shop. It was full of the latest gadgets, from fancy refrigerators to 3D HDTV. All the gadgets were real and available on the market, not conceptual. Refrigerators held free drinks and everything was mean to be played with. In the back corner, there were some art displays, which included a giant electronically actuated “piano” that some 15 year-old put together in his parent’s garage in 3 days, and a post card maker and music video maker from the band “Arcade Fire”. Another displays consisted of a flock of electronic birds that would fly down towards your shadow if you moved. Downstairs there was a “Geek Dad” event, where fathers and their kids were making digital comic strips from Lego action figures, playing foosball and ping pong, and generally having a good time. We walked along Houston and passed the graffiti wall, which is painted by celebrity graffiti artists. The current image, brightly spray-painted globs of crazy faces all mashed together, had just been finished the previous week by Kenny Scharf. A few blocks farther was Katz’s Delicatessen, another famous location from the movie “When Harry Met Sally”. Unfortunately, we were starving and the line was around the block. Instead, we opted for a quirky Turkish place next door. Evidently it’s a favorite hangout for cops, as there was a traffic police officer there, and the counter was covered with police and detective business cards. The food was delicious, even if the presentation didn’t exactly match the pictures shown on the menu. We took the subway directly to Rockefeller center, and surfaced inside 30 Rock. The line seemed long, but it didn’t take long to tickets. The tickets had a time stamped on them for 30 minutes later…evidently they want you to spend some time in the gift shop first. Instead we went to Anthropology, and looked around. One poor husband sat on the steps outside the store, staring unresponsively under a Christmas display with strands of paper icicles lying on his mostly bald head. Back in line at Top-of-the-Rock, we took the elevator up 1 floor before being shuttled to an escalator that led to another room with some historical displays. After that, we were forced to watch two 4min. movies about Rockefeller Center and Swarovski crystals before being allowed to go in the elevators to the observation deck. The elevator had a transparent ceiling with lights that lit up the passageway as we zoomed up 60-some stories to the 70th floor. The Top-of-the-Rock arguably has better views of the city than the Empire State Building because the Rockefeller building lets you actually look at the iconic Empire State Building. The three viewing levels had no protective iron bars to block the view and allowed people to spread out more. We arrived right around twilight. The temperature had dropped with the sun and it was very windy, but the views were fantastic. The first and second levels had protective glass, which although good for blocking the wind, were bad for taking pictures. Fortunately there were gaps between the panes of glass just wide enough to fit a DSLR camera lens. The third level was set back, and did not have anything blocking the view (or wind) at all. It was still early (6pm) so we decided to walk around 5th Ave again. We went back to the Anthropology store and bought a few things from the sale section (the sale section itself was almost as big as some of the Anthro stores in the Seattle area).The poor, bald husband was still there under the paper icicles, despondent. We passed Cartier, with its building wrapped in a giant red Christmas bow to Grand Army Plaza. A small crowd had gathered here, most of them dressed in black. A huge menorah (the largest permitted by the Torah…according to the presiding Rabbi) was being lit. A cherry picker lifted the Rabbi to the top of the menorah, where he gave a small speech (the most memorable line being, “We will not negotiate with terrorists”) and lit the menorah. After my meeting with JAL, I headed to Tokyo station, to find an outdoor store/restaurant called Gendarma, that was mentioned in the Lonely Planet guide. Supposedly, salarymen gather here after work to talk about hiking and climbing. The directions were admittedly poor - all I had to go by was Kyobashi 1-9-9 (which I assumed was the address). I found a map by the station exit and tried to interpret this address. The map blocked out districts (such as Kyobashi). Different blocks in a district (and sometimes several blocks together) were given a number (such as Kyobashi 1). These were further subdivided into buildings, and then each location on the building was given another number. I found the location on the map, and headed in that direction. Few of the businesses have addresses on them. Eventually I found the place, but it was very quiet on a Monday. On the second floor, it looked like a club was having some sort of a meeting. On the first floor was a store, so I took a look around and I bought some trekking pole clips. Afterwards, I headed back to the hotel to get some sleep. The next morning, I decided to head to Narita early, and maybe have a look around town before heading home. I took the N’EX train to the airport, where I checked in and checked my baggage. Downtown Narita is only two stops away on the Keisi subway line. From the station, it is not obvious where the main temple complex is, so I asked a lady - who spoke no English. She tried very hard to give me directions, even drawing a small map, but it still didn’t make sense to me. She did get me started in the right direction. As I turned the corner towards the JR station, a street with a red sidewalk was lined with gift stores and traditional food stores. This felt right, so I followed this road, and soon the roof of the Naritasan Pagoda came into view. The food for sale was unrecognizable to me, except for the eels. Other places sold getas, yukatas, pottery and beautiful fabric (all much cheaper than what I saw in Tokyo). I eventually reached the temple and walked around. Buildings surrounded the two-tiered pagoda, where a ceremony was taking place. A sign said to remove your shoes and “jump right in”. I watched from outside. Priests lead a chant; one was banging on a giant drum, while another tended a fire in the middle. I continued on through the deeply forested gardens, which were full of giant stone carved tablets. I reached the main Naritasan pagoda (the one viewable from N’EX) and entered inside. I removed my shoes and climbed the steps to the second and third levels, each containing thousands of tiny wooden Buddha figures. I presume these are something you can buy and have placed in your name. At the third and topmost level, several small shrines populated the darkened rooms, and a women was chanting sutras very quietly to herself. I left the main pagoda and continued on to a courtyard. A temple with a giant sword over the entryway was dedicated to Japan’s fallen soldiers. Unlike the other temples, it was largely unpainted, and seemed very weathered, but definitely not neglected. Votives hung all around the outside. One of them had targets (like from a shooting range) framed in it. After touring the temple grounds, I returned to the airport and boarded my plane. The man I sat next to is a FedEx pilot who fears Airbus (he told me this before I said I worked for Boeing). He said there is a great restaurant/store in Narita full of airplane memorabilia called The Jet Lag Club that I should go to. If I can find it. Unfortunately I had forgotten about the international dateline when I made my travel arrangements. I assumed I would be arriving in Tokyo on the 26th, but it was actually the 27th. The Keio Plaza was full, but I managed to get the last non-smoking room. This also messed up my plans for Nikko. Instead of a leisurely two-night tour of Nikko, I would only have one. I re-booked my hotel room at the Turtle Inn, and decided to head out early so that I could tour the temples on the first day (they close at 5:30). Also, it was getting close to fall, and tickets to Nikko sometimes sell out. I arrived at the ticket office an hour before opening, so I stopped at a nearby café to get some breakfast. After picking up my tickets and getting some train/bus information, I headed for Track 5, Car 5. I noticed there were many people with backpacks, probably heading for Nikko as well. Two hours later, I reached Tobu-Nikko Station, where I caught a bus to my hotel. I immediately dropped my bags and headed out to see the temples. It was a very foggy day - they called it rain but it never really got you wet. Nevertheless, everyone had umbrellas. They don’t do rain jackets in Asia, that’s a Pacific Northwest thing. Perhaps the rain kept some tourists away because many of the sights were relatively empty. I toured a beautiful strolling garden, and then checked out a small art museum. The museum had old paintings of the temple grounds, which would mean more to me later after I had seen everything. Next I went inside Rinnō-ji temple. Three giant golden Buddhas sat inside the Sanbutsudō, one of them was a 1000 arm Buddha, but he only had 43 arms (each arm has the strength of 34 normal arms). A fact I learned from the tour group I was following. After touring the temple, I headed up the road to Tōshō-gū Temple, the final resting place of Tokugawa Iewasi (founder of the Shogunate). The entire sacred area around Nikko was covered with a forest of ancient cedars. Roughly 2,000 of these were planted here in 1625 and, amazingly, most have survived. I wonder how different it looked back then. A giant torii and a 5-tier Pagoda rose on the left, however the biggest attraction was the Yōmeimon Gate. It was ornately decorated in a unique style, mostly white, with black and gold lacquer. Personally, I thought the design felt too busy and cluttered, and I didn’t like the colors. Just past the gate, the stables had beautiful carvings of monkeys, representing different phases of life. A friend comforted a sad monkey and a happy monkey looked upwards. A pair of newly-married monkeys (one was frowning) and a lovesick monkey illustrated those feelings. However the most famous monkeys are the three wise monkeys - see no evil, hear no evil, speak no evil. I continued on, and bought a ticket to go up some steps. I didn’t really know what the ticket was for, but I wanted to find out. I passed under a gate with a small cat carved over it (this was a famous cat, because the picture was on my ticket). Everyone was taking pictures of the cat, but it was so small. I later found out that this cat was allegedly carved by Hidari Jingoro , a legendary and possibly fictitious artist. After passing through this gate, I climbed a series of stone steps, rising through the cedar forest. The forest was humid and I couldn’t see far as I made my way up. A small shrine rested up on top. This iron structure contained the physical remains of Tokugawa Ieyasi. After returning to the main temple grounds, I toured another the Futurasan Shrine complex. Monks chanted and rubbed prayer beads (making a zipping sound) as they went from shrine to shrine. Plastic ponchos covered their robes, rice hats and wooden sandals. Next, I visited the Taiyuin Mausoleum. A beautiful garden surrounded the grounds of the mausoleum, however much of it was off limits. Two towers flanked the main entrance. One tower housed a bell, which signifies death. The opposite tower housed a giant drum, which symbolizes life and birth (similar towers were also at Tōshō-gū). Afterwards, I went through the treasury before heading up a stone path to a small, remote temple. Women leave votive offerings at this temple if they want help with their love life. Strangely enough, the only other person there was a sulking young man slouched behind the building, seemingly hitting random notes on his miniature, portable (toy?) synthesizer. I took a different road down instead of retracing my steps. The large stones were difficult to walk on and I wondered if it was smoother in ancient times. The road led to a waterfall, and another complex made up of small temples and shrines. There were seven in all, if the numbering was correct. The mist was so thick in this part of the forest that I checked my watch, thinking it was getting late (it was only 3:45pm). The temples in this part of the complex seem rarely visited. A hush hung over the misty woods - dark, moist and green - creating an ancient, almost spiritual atmosphere. I passed many more markers and Buddhas on the way out. Eventually, I reached Nikko town again and exited the trail/road near Shinkyo Bridge. The bridge, which looks beautiful in pictures, was disappointing. On one side, a fence separates the river from a busy highway, rendering the bridge unusable. You can still pay to cross it, however, which I did not do. DSC_8862, originally uploaded by marmot_oo7. Baori (Step Well), originally uploaded by marmot_oo7. The lady at the front desk hadn't called a driver for us, despite the fact that she said, “Ill arrange it.” Four times. We booked another car and the driver arrived within five minutes. The driver did not speak much English. However, a man with greased-back hair and a pin-striped suit rode with him, presumably his boss. This man did all the translating, and we couldn't help but get the impression that he was sleazy. The plan was to head to Balaji, 102 km away, to visit the Hindu exorcism temple, and then to Abhineri to see the step wells. Both are on Jaipur-Agra road. We headed out of town in our silver Tata Indigo, and made good time because traffic was light at 8 am. Balaji is home to a Tantric Hindu Exorcism temple. Really, Lonely Planet didn't tell us much more than that, other than Tuesdays and Saturdays were the busiest times. And that some of the scenes might be disturbing. On the road, we passed camels and tractors. Trucks loaded beyond capacity sagged and cars overflowed with people even riding on top. Although we saw tourist buses, but the people riding in them looked anything but tourists Some buses had no windshields. After the turnoff, it began to get crowded. At this point, John thought this might not be so bad, since there were quite a few tourist buses. But, as we looked around, we found that we were, in fact, the only tourists. Eventually our driver had to park, since the road was closed. At first, the crowds were light, but as we walked further it became more and more chaotic. Food stalls and oblation stands serviced the crowd. One sold magic eye pictures featuring Hindi gods. The crowd thickened as we reached a chained-off area in front of the temple. Whether this was just because of the temple or because it was a Saturday, I imagine it is generally packed either way. The temple, a plain white concrete building, didn't look like much from the outside. Stretching out from either side was a barred off area and lines of people, holding food offerings, that continued for blocks. One young women started pushing her way through the line, wailing as she went, and people let her through. Most people wore serious and worried expressions. Outside the temple, the TV monitors that were supposed to show what was happening inside weren't working. One man told us, “request, request,” and pointed to some guards near the entrance of the temple. John and I went and stood near them. The guards opened the gate and let one man through. Suddenly, others took notice and rushed the gate. The guards saw us, pointed us out of the crowd and let us through. We passed through a metal detector, then a man led us to a small room and had us fill out ledger. We noticed that all of the other visitor entries were in Hindi. This was obviously not a tourist attraction. He asked us what our jobs were and we told him, “engineers.” “Scientists?” He said, with a big smile, and we just agreed. At this point, John said he hated me, hated me so much for bringing him with me. Were we going to Indian jail? Were we going to be exorcised? Yelling reached our ears through the chamber walls. The pseudo-guide led us into the next room, and had us wait. The guard too me down a hall and past a man, who was chanting into a microphone. The man pointed at my shoes and I pointed at my guide. He panicked and pushed/ran back to the first chamber so that I could remove my shoes. We retraced our steps down the hall, into the temple. Thick, iron bars surrounded me. The chamber was dimly lit. To the right a narrow pathway was crammed full of people yelling and screaming as they offered/threw food at a person who collected it. To the left, anther set of iron bars. Then what appeared to be a big lump of gold with eye-holes cut out. My guide whispered, “red, red, can you see it?” But all I saw was that big gold thing. Maybe a statue sat under the gold sheet. Incense burned, adding its strong scent to the chaos. I returned to the main room, where John was still waiting. The guide took him next. John put his head through the iron bars, but did not notice anything different than what I saw. We left the temple the same way we came in, the lines still stretching forever in both directions, with people shoving and rushing to get in. The driver was still waiting for us outside the road-block and we took highway toward Abhineri. The road took us through the country, where we saw a school having class outside. We arrived at the small town and walked up ancient 10th century ruins. The ruins had been an old temple, long-since defaced (destroyed) by the Mughals. Now, it is just a bunch of stacked stones with a small piece intact, in the middle. What carvings were left were beautiful. Worshipers rang the two bells as they entered and exited. Our driver followed us up, rang the bell, knelt and gave a small prayer. He then directed me to take a picture. Hinduism seems much more relaxed than many religions. Across the street was the main attraction, the step wells. From the outside they didn't look like anything more than a blank wall. (Hmm...this feels like a theme). We walked through the columned entrance, and looked down at the MC Escher-like scene below. Once again, the only visitors, we circled the perimeter, following the steps with our eyes, down, to the green water below. A guide, who we never asked for, followed us. Since we didn't seem to have a choice in the matter, we let him take us down the steps, through the bath area. In ancient times, the King and Queen would bathe here. A hole showed where oxen would turn a crank to pump water up from the well, now filled rats and bats instead of water. Two diving boards jutted out from the middle level. The guide said it would be open for swimming again August 31. In 2 days. The green, algae-filled water below made us wonder. Munich, originally uploaded by marmot_oo7. I arrived in Munich around noon, and took the S-Bahn to the Hauptbahnhof. My hotel was easy to find; only about a block away from the central station. I greeted the man at the desk in German as Claudia had taught me although, of course, he spoke perfect English. The room was as small as I had expected, although the bathroom was quite large. In fact, they were about the same size. Everything was spotless. I had all afternoon still, so I decided to walk to Marienplatz. The weather was fine, and the main pedestrian street was full of tourists. I was surprised to see many Arabic tourists; the headscarves, burqas and even niqabs stood out amid the European attire (hadn’t I just left Dubai?). The façade of Michaelskirche was covered in scaffolding but the interior was beautiful, with an impressive barrel vault. On the right-hand side, two open doors led to a staircase in the floor. I descended into the crypt, which held the remains of 40 Wittlesbachs, including Mad King Ludwig II, himself. Queens, kings, dukes and barons rested here - all with titles ending in “Von Bayern” - of Bavaria. King Ludwig II’s iron casket was the largest and his site was marked with fresh flowers. Next, I visited the Frauenkirche (Our Lady’s Church). Her double-steeple onion dome is an icon that defines the Munich skyline. In the courtyard, a woman played the hurdie-gurdy. Frauenkirche was cleverly designed to appear windowless when you first step inside. A well-worn black footprint in the floor is where, legend has it, the devil stood and laughed at the fact that they designed a church without windows. Take a few steps further, however, and you are greeted by the soaring stain-glass windows, including a few survivors from the war, that were previously hidden from view by columns. At Marienplatz, the New City Hall and its Glockenspiel looked old and in serious need of cleaning. The Old City Hall, around the corner, looks new. A tent with a stage was being setup for an Iran peace rally. Later, Marianplatz would be filled with the sounds of traditional sing-a-long Persian music. As I returned to the hotel, I was surprised to see barricades being erected and soldiers in uniform. It turned out the National Socialist Nazi Party (all seven of them) had also planned a rally. They held flags, gave speeches and played rock music to the large and jeering crowd. I couldn’t exactly understand what the crowd was yelling, but the finger they held up was pretty clear.